Amongst the wide range of occasional chairs available today the wing-back armchair has perhaps the most enduring pedigree, tracing its historic roots back to fireside chairs in the homes of the gentry. Our winged chairs are equally at home with traditional and contemporary fabrics. 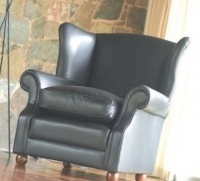 You can click on an image below to learn more about any wingback chair. Once you see one you like, you can select a fabric from our Designer's Choice and then securely and quickly order on-line.